Opinion: Just how healthy is Colorado? Colorado ranks among the best in nation when it comes to overall health. However the state has some opportunities for improvement, according to the 23nd annual Americas Health Rankings from United Health Foundation. The report, the longest running of its kind in the country, placed Colorado No. 11 among all 50 states for overall heath, up three spots from last year. Low prevalence of diabetes and obesity: Colorado has the lowest obesity rate in the U.S. at 20.7 percent of the population with 805,000 obese adults. Colorado also has the lowest diabetes rate in the U.S. at 6.7 percent of the population. Low prevalence of sedentary lifestyle: Coloradans are more active than all other states with the lowest prevalence of a sedentary lifestyle. Low rate of preventable hospitalizations: In the past 10 years, the rate of preventable hospitalizations declined from 57.2 to 46.6 discharges per 1,000 Medicare enrollees. Smoking and binge drinking are prevalent: The prevalence of smoking in Colorado is slightly below the national median, but at 18.3 percent of adults, it exceeds the Healthy People 2020 objective of 12 percent of adults. In Colorado, 711,000 adults smoke. In addition, 20.1 percent of the population report binge drinking. Higher rate of infectious diseases: In the past year, the incidence of infectious disease cases rose from 7.3 to 11.1 cases per 100,000 population. Low immunization coverage: Colorado ranked 45th in the U.S. related to immunization coverage, with 86.8 percent of children ages 19 to 35 months covered. Colorado residents are getting many things right. While we should take a moment to congratulate ourselves for these successes, we cant take continued progress for granted. Significant challenges remain. As UnitedHealthcares medical director for Colorado, I have witnessed efforts statewide on behalf of the public and private sectors to improve certain health trends, such as the prevalence of binge drinking and immunization coverage, and to improve our overall health outcomes, such as reducing infant mortality and geographic disparity. UnitedHealthcare Colorado has several programs in place for businesses that seek to address the health concerns underscored in this years Americas Health Rankings. Wellness incentives: UnitedHealthcare offers wellness benefits to both large and small employers in Colorado. The programs encourage healthy behaviors and target specific health actions using customized information, financial incentives and ongoing support. Well Deserved Award: UnitedHealthcare annually awards employers who demonstrate an exceptional commitment to helping their employees improve their health and well-being through worksite wellness programs. In 2012, Jefferson County was named a recipient of the Well Deserved Award and received a $1,000 grant to support its wellness programs. Support of community activities to promote healthy lifestyles through cycling: Each year, UHC Colorado and the UHC Pro Cycling Team encourage active lifestyles through cycling by participating in events like the U.S. Pro Cycling Challenge and Bike to Work Day. In addition, UHC leads a program called Bikes for Life, which equips Denver-area youth with bikes, helmets, jerseys and important bike safety education. The program is intended to serve as a catalyst to inspire our states youth to become advocates and role models to their families, their peers and the community about the importance of reducing childhood obesity and living active lifestyles. Together we can break down barriers to high-quality care. And we can win. It will take work and time, but our health is worth that effort. 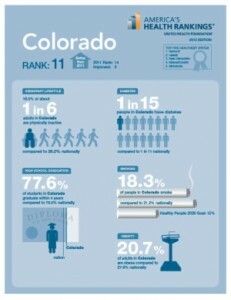 For more information about Americas Health Rankings, please go to www.americashealthrankings.org. Bill Mandell, M.D., is medical director for UnitedHealthcare of Colorado.